We did it! 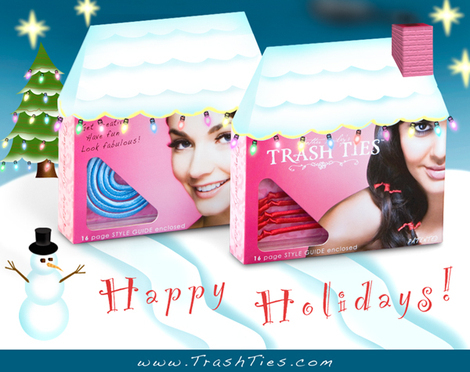 And I can't believe we pulled this off in time for Christmas -- It's Trash Ties day!!! My once-buttoned lips are now happily unfastened and I can freely talk Trash. This is a big day for Isaac & me. We spent a good half of 2007 designing, photographing, planning, re-designing, sourcing, proofing, printing, and planning some more. There have been a few rocks on the path and a couple of big boulders, but we forged ahead. And now here they are, cute little pink boxes of Trash Ties, looking all innocent and easily-accomplished. Isaac just finished the new Trash Ties website today and I've started a Trash Ties blog!! So much of my personal history is wrapped up in my adventures with Trash Ties (movie sets, patent stuff, fancy stores, big magazines, tiny apartment, terribly-sick baby, incredibly-worried mommy, rapidly-growing business, and a big decision to hold off on Trash Ties till the patent came through, etc). I wanted a place where I could recount some of those stories, hold contests and challenges, and we could have all sorts of madcap fun with hair. I probably said it better over there; I'm all googly-eyed and goofy at this point. So stop by the new blog & website and see what I've been up to for a big part of the year. I bet you can even track down the front view of this curious photo. 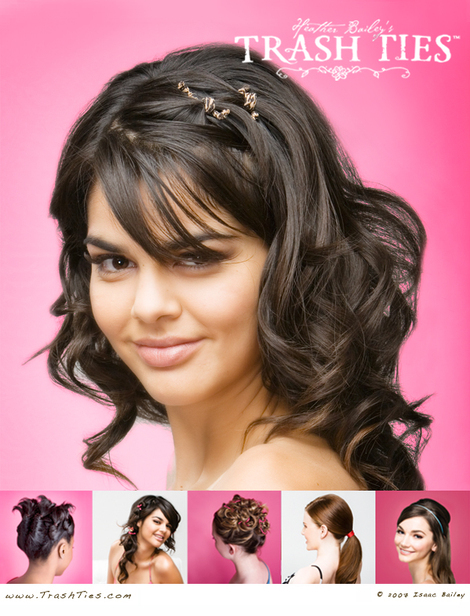 There are a crazy-ton of pictures and all of the info you need to finally see what I was wearing in my hair last Easter. That was an accidental sneak by the way, not so much a sneaky sneak (though I like those). And sorry about keeping quiet. People go crazy over these and I didn't want you wanting them until I could deliver. But yes, go read my first post over there and then have a look at The Basics pages in the sidebar and Isaac's pink palace of a website. He even programmed a video slideshow and lovingly turned these little pink boxes into a Winter Wonderland. He cracks me up. And here's a coupon for your holiday shopping pleasure, good through December 10th. You don't really need the coupon, just the code, but I couldn't resist. (BTW, and completely unrelated, if you haven't learned the words to Sesame Street's I Love Trash, then you're not truly living.) The above code will give you 15% off your entire order -- just for you guys. 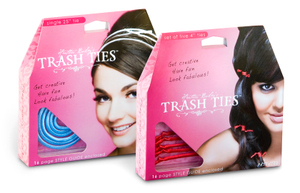 So many of you have written, wanting to buy Trash Ties without even knowing what they are - wow! And yes, the shopping cart is set up for international sales. Follow the Globe symbol for details. 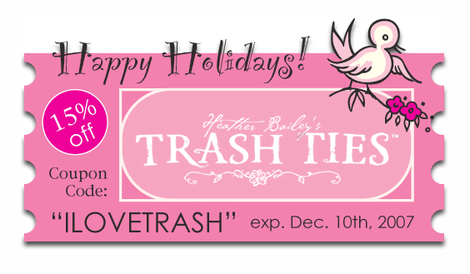 So, go to the Trash Ties blog to see what these babies can do and put that cutie coupon to good use. Yay for Trash Ties day! We made it. I'm excited to finally share these with you. It's a good day. Update: A few of you had difficulty paying through PayPal earlier today. I wanted to let you know that Isaac has since worked with GoDaddy to implement a solid and secure solution that allows you to pay directly in the store. Now everything is working smoothly! I apologize for any inconvenience. Another Update: If you've placed an order or are about to, make sure to read through this bulleted list I just added at the Trash Ties blog covering shipping dates, coupon tips, site security and a giveaway!